Then someone suggested, "Take a picture of it. Then pass it on or throw it out." (Actually, to be honest, I've heard this idea from several sources.) What a great solution! I can pull the picture out any time I feel nostalgic, but I no longer have to store the object! One of the first things to undergo the transformation from 3D entity to 2D memory was my collection of dolls from my own childhood. I had kept them in order to pass them on to my own daughter. ... Then I had four boys. You might say, "Boys can play with dolls." Yes, they can. But mine don't. A couple of years back, I picked up a Caillou doll (i.e. a boy doll) at a yard sale. Zero interest. Absolutely zero interest from three out of the four boys (the fourth being too young to be interested in such toys; he thinks eating sand is the best activity in the world). And now my guys have entered that stage where every plaything is crashed, bashed or smashed. 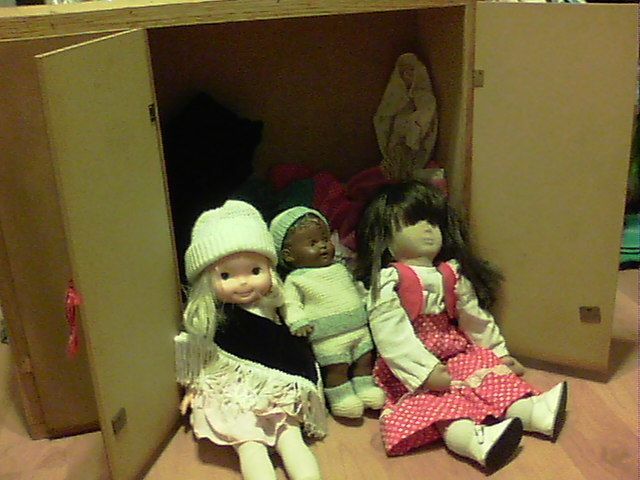 I want my dolls to have a better life than that! 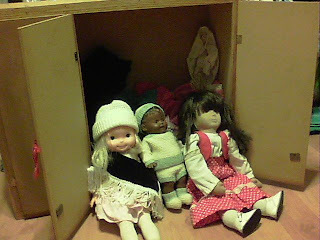 So I've opted to pass on my dolls --along with the wardrobe that my grandfather built for their clothes-- to a good friend whose daughter is the same age as our oldest son. She's excited to receive them, and I can imagine that she'll play with them for many years. It feels good, of course to reduce my hoard, but more to share my treasures with someone who'll appreciate them and to give her the delight of having something lovely. And I'll always have the pictures to remember "my girls" by.